- Date: 02/2013, Seed: $1.1 M (post valuation: undisclosed amount). At KnexxLocal, we build tools to help local businesses get more word-of-mouth referrals online. By automating the process of getting customer reviews online, adding photos for greater interest and credibility, and making it easy for customers to share those recommendations with friends, Instamonial is creating opportunities for local businesses to get word-of-mouth referrals in a whole new way. 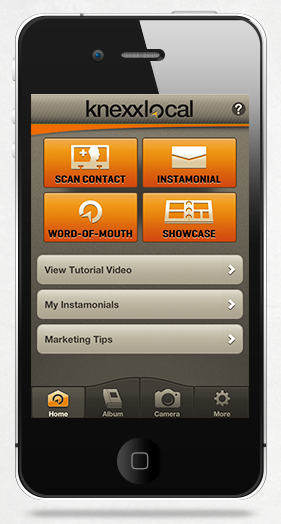 Instamonial™ by KnexxLocal is a free iOS app that makes it easy to get word-of-mouth referrals online. Word-of-mouth referrals can make or break a small local business business. KnexxLocal gives businesses a way to increase those referrals online with stunning Instamonials (and a little help from their best customers). With Instamonial, you can showcase your work, give your reviews credibility and update all your online channels - from your custom page or website to social media pages - all in one step. Instamonial also makes it easy – and fun – for customers to share their photo-based Instamonial reviews online. From social media channels like Facebook and Twitter to review sites like Google Places, KnexxLocal automates the sharing process, exponentially increasing the power of every review. KnexxLocal was founded in 2012 to help local businesses to connect with more customers through word-of-mouth referrals online. The company’s free iOS app, Instamonial™, automates the process of securing customer reviews online, and turns those reviews into powerful, photo-based Instamonials that customers can share with their friends across social networks like Facebook, Twitter, LinkedIn, Pinterest and more. To learn more, visit http://www.knexxlocal.com. Currently VP of Marketing at KnexxLocal, Victoria Badgley is a passionate marketer with over 12 years' experience in the world of technology, start-ups, and marketing solutions. Comment - I like this update!